Could you live off-grid without a refrigerator? Susan Gregersen has for over 30 years. 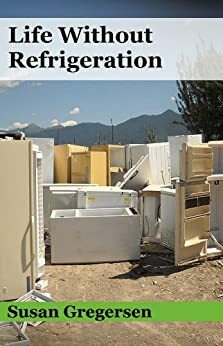 She wrote Life Without Refrigeration to share her experiences and tips for preserving food without benefit of a fridge. She explains how bacterial growth and spoilage occur, and why some foods need to be kept cold. With each method of storage or preservation, Ms. Gregersen offers examples of which foods are best suited for that method. I was particularly interested in the dairy and meat suggestions and found some new ideas for dehydrating that I plan to try. Especially cottage cheese and sour cream. Apparently it is possible. As another alternative, she gives information on commercial dried and canned meat, dairy and eggs, and alternatives. Raising meat and dairy animals is also an option. I have stored food in my unheated workshop for many years with great success. Mostly canned, dehydrated, or dry goods, but also citrus and root veggies, wrapped in newspaper and put in boxes. It is very important to pay attention to signs of spoilage and know what kinds of storage or preservation are safe for the foods you are storing. Also how soon to use them. Although Susan does not give detailed instructions for the projects offered, they serve as a springboard for ideas to further research. To sum up, this book is a handy reference guide to all of the above, for the beginner. If you are looking for more advanced storage and preservation methods, such as for meat and dairy, it is a good jumping off point. I bought Life Without Refrigeration from Amazon, Kindle Version. I did not receive any compensation for this review.